RTA Studio navigates through a minefield of rules and regulations at Torpedo Bay. 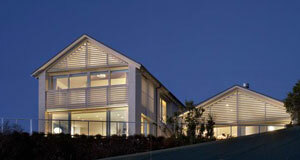 RTA Studio’s new house on the cliff edge at North Head in the Auckland suburb of Devonport is built in the footprint of an Arts & Crafts cottage. A cluster of courtyards provide shelter for a house on an exposed site with harbour views. FOR AN AUCKLAND HOUSE, this family home in Devonport is very nice indeed, something that’s not a slave to style for a change but well related to its site and well suited to the lives of its owners. As a project on a very restricted property, assailed by Council planning rules and guidelines, it has had its moments but its owners say “it has come out better than we ever expected. It feels like a home and it fits in with the neighbourhood”. 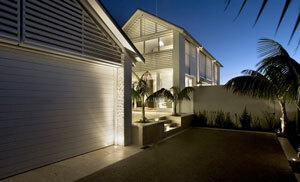 The house is perched on a cliff edge at North Head just above Torpedo Bay. For decades the Navy has occupied the foreshore below the site. The house has been re-built in the footprint of an original Arts & Crafts cottage, with additions in the form of pavilions to the west. The owners lived in the cottage for a year to get used to the site, but the original house was too far gone to be preserved to any extent. Council planning rules are tight in Devonport and heritage issues were always going to be a concern, too, particularly for a house that is located at the base of one of Auckland’s iconic volcanic cones and is so visible from the water The owners had several meetings with North Shore City Council and its heritage advisors to work out constraints before approaching architects. Even then, there were a few dramas during the building process when it was discovered that the original structure was in worse condition than anticipated and replacement was necessary. The old cottage has been virtually rebuilt to the same floor area and roof pitch though things are now much different on the inside. The front door is in the same location, bracketed by an original leadlight window, but is now protected by a sheltered courtyard and outdoor living area with fireplace. The new two-storied living and kitchen pavilion has the main bedroom and study above and is separated from the original cottage by a glazed link that demarcates old and new. 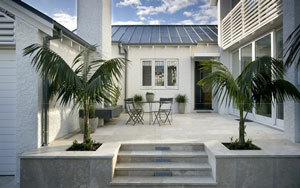 Clearly contemporary, the house is still sympathetic in scale, roof form and detail. Exposed sites such as this, with sunlight to the north and, perversely, views to the south, can be difficult to deal with. Architects RTA Studio have responded to the challenge by creating a cluster of courtyards between pavilions that reconcile sunlight and views in a variety of different locations, and also provide shelter from the weather whatever direction it’s coming from. This design strategy gives the plan of the house a relaxed, stretched out feel, and it also allows the family to occupy the whole property. The house has four bedrooms and a study, and they are spread throughout the house rather than being clumped in one spot. The consequent privacy is particularly welcome to one family member, a yoga teacher who used the quiet and sunny studio – “a lovely serene room, the best in the house” – at the northeast end of the house for her classes. When an architect is offered a great harbour view it is always tempting to lap it all up through an acre of gormless glazing. This house, however, is shot through with nicely placed windows that let in a balanced amount of light and allow a variety of view shafts to the outside world, yet preserve the interior from the neighbours’ eyes. This characteristic is particularly evident in the angled slats or louvres that screen the gables and the upper floor bedroom. The slats filter daylight and work to make the bedroom feel slightly layered away – nestled at the top of a tower, not too exposed to the world even though it is surrounded by glass on three sides. The forms of the new pavilions draw on the character of the original cottage as well as the simple boatsheds of the bay below. The crisp white walls and grey zinc roof are a bit uptight and school uniform for me, though this is the North Shore, after all. But really, there’d nothing pretentious going on here and the place has the “simple, elegant, classic” look to it that the owners requested in their brief to RTA. One of the house owners is involved in the building industry and chose RTA Studio because he thought they would do the most organised, professional job. Under the direction of partners Richard Nash and Tim Melville the youngish practice has designed a number of houses, not in any particular style, but is probably better known for its commercial and education work. Over the past half a dozen years RTA Studio has acquired a reputation for successful adaptive reuses of existing buildings in Auckland’s inner city suburbs. (One such project, the renovation and extension of an Edwardian shop building in Auckland’s West Lynn neighbourhood, received an NZIA New Zealand Award for Architecture in 2006). The Torpedo Bay house was a couple of years in the planning and construction but because it was well thought through by both clients and architects there were few variations on the job, despite the defects uncovered in the original house, such as unreinforced concrete walls lacking footings or other visible means of support. The new house also has a quality of fittings that are rather in advance on those of its predecessor, such as ducted heating under the concrete floor slab, which is finished in French oak flooring, and double glazing throughout. The glazing keeps the house warm, of course, but it also reduces the need for curtains, and the placement of windows ensures decent cross ventilation in summer. 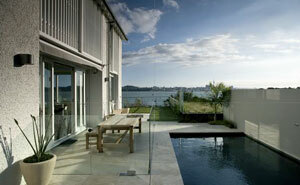 The house is well-sited to take advantage of the maritime breezes that disturb the torpor of an Auckland February. Lots of storage (where did they put stuff in the old days? ), large cupboards occupying whole walls, a big wardrobe and walk-in pantry mean that doors can just be shut on domestic clutter. With the raft of constraints that architects have to deal with today, especially in a ‘heritage’ suburb such as Devonport, it is nice to see that one can still get a good result from a difficult, thought spectacular site. In the end, successful architecture comes down to good design and the observance of some old-fashioned architectural values, such as attention to site and client needs rather than to passing fashion. Attending to clients’ requirements also entails going in to bat for the clients – finding ways to work within Council rules and guidelines, without being cowed by them.